BioFlex is another highly biocompatible body piercing material that contains no nickel. It is available with a transparent clear or black finish and is used to create BioFlex belly bars, BioFlex nose, BioFlex labret studs and a range of BioFlex hide it studs and shafts. It can easy be steralised with an autoclave and can be cut to your required size with a sharp knife or scissors. 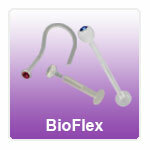 BioFlex is very flexible making it the ideal solution for an initial body piercing. "JoBananas are great - the products are very high quality, and the customer service is excellent. I recommend them." "Excellent quick service bars very good quality"